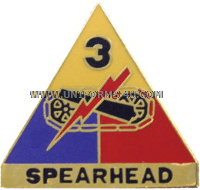 Like the Distinctive Unit Insignias, or Unit Crests, of other armored Divisions, the 3rd Armored's features its Special Designation--Spearhead--on a rectangular base atop which is placed an equilateral triangle. Mobility, firepower, and speed are represented by the images of a tank tread, the barrel of a cannon, and a bolt of lightning. The tri-color design is employed to represent the three types of forces—cavalry, infantry, and artillery—that make up an armored division. Also like other armored divisions, the 3rd's Unit Crest is identical to its Combat Service Identification Badge.